50 Comments to "The 2018 Season Has Arrived: Spartans and Eagles Scrimmage"
to ANON….not everyone gets transfers. 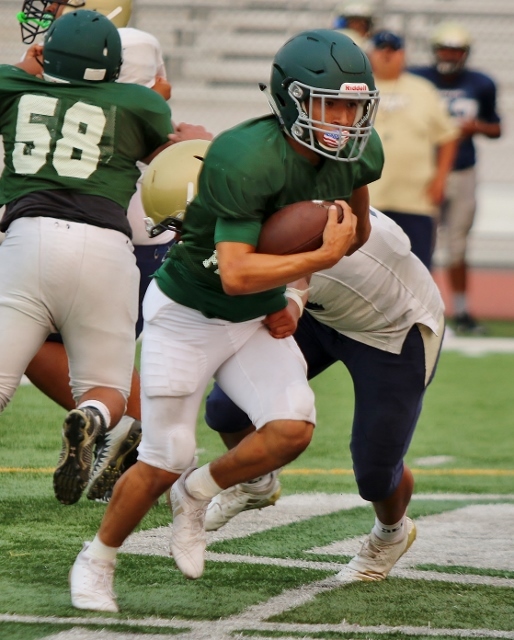 To annonymous…it’s not the point that they are div 13 kids and schurr CAN”T win with their own kids…the point is they have to make themselves look good instead of doing what is right. Ironically they may look real bad after cif denies the players. Odyssey says deal with it the transfers are here. Yep and they may not be there for long! Hope they all get denied and have to look at their ( just as dumb) parents for buying what schurr was selling…and that is another what? Title”jajajajaja. Eagle football is back. I didn’t go to the scrimmage, I don’t need to. Why are so many people putting so much into a scrimmage game? You guys ever play a scrimmage? Everyone plays, playbook is very small and your practicing scenarios. Those who are putting Down the SOUTH because of a scrimmage game either have never played ball or have an agenda. I went last year to the scrimmage vs Schurr and SEM got blown out there too but they went on to the semis. Obviously this coaching staff is doing something right. All this crying needs to stop, loyalty to a school isn’t what it was before. Around 10 years ago kids went to the school they were next to most likely because family went there, friends or because that was their home school. Not anymore and that’s fine, those schools not getting the transfers are the schools that are bad and the schools getting them are solid teams. So you that believe in winning with homegrown talent go do it but when these kids from the next district come and want to transfer in cause you went to the quarters or semis, deny them. Winning come anyway possible if that allowing a kid or talking to a kid and selling your program that’s good for you. Go out there and play. Sounds like a good scoop. Being the local news reporter extraordinaire, maybe you can shed some light on the topics. Last night @ MHS, going to be a long year guys so prepare for it. @ Schurr parent well said! Well there you have it!! Your own parents are upset as anyone would be. If your kid is there and has earned the right to play, NOBODY would be happy if the staff you have worked so hard for goes out and gets new kids and then to compound the issue (illegitimately). One or two squeaky chirps maybe a discruntal person. But when you have a plethora of people/sources saying the same thing there must be truth to it! I was told once “ If there is smoke-then there must be a fire” police yourselves Schurr staff/administrators and ultimately the HEAD coach. Football is back!! people need to realize nothing going to happen, the transfers are here so just accept it. @ Anonymous, they talking about Pete Gonzales dummy. He graduated from Cantdowell. Dummy. Every school has transfers people. You people probably cheat on your wife’s! Where’s the loyalty your speaking of? If there is a cantwell coach on staff at Schurr that’s automatic undue influence. Let’s see who pays for it with their job when this hammer hits the ground. Once the season kicks off are you guys (or girls) still going to be talking about transfers? Geez…let’s hope not! I heard from a friend who called CIF and turns out a certain coach that graduated from Cantdowell recruited several of the kids while they were still at Cantdowell(nice alumni) and when they gave him the bird he called Cantdowell several times asking them to complain to CIF. CIF has been given proof of the recruiting by the Cantdowell grad and the hammer you talk about is going to drop but it will be on you my friend. Week 10 all this talk will be for nothing. Then all the concerns and worries about others programs, will mean nothing if your team isn’t in the playoffs. I admit it was me. I called everyone to complain because our team is sorry and these kids didn’t want to come to MHS and play for me, can you believe it, me? I have four league title in a roll with nothing but real local kids, no transfers, all legit. But yet I lost out on all these kids, why? I am the best coach around with only legit local kids. Why, I ask, why? annoymous, you are absolutely right so why peeps making a big deal about it? Because their team is horrible. FACT! No one talking one bit about their team. No one talking about how kids don’t want to play for their coach. That is the real story here, not recruiting. Coach recruited every kid and they all said take a hike. But this won’t make the blog. When a kid tells you I will never play him that pretty bad. That’s why he really mad, cause he got shown the hand. Whoever takes in Cantwell Transfers has to be desperate. Cantwell won their league last year because the So. Catholic League D13 is horrible. If Schurr can’t win with their own players, than they are pathetic. Why don’t you call CIF and ask who is crying to CIF. If you have any character you can then report to us the truth of who is calling CIF. You might be surprised. From what I’ve heard its all the schools calling and some of your own unhappy spartan parents whose kids are not playing? I also heard Cantwell was contacted by CIF as was Buena Park. You can say what you want about Mhs but i think the problem is with Schurr. Its their kids that are on the website under review. That has nothing to do with someone crying to CIF. Who’s fault is that? We don’t care one bit what goes on at Schurr. Quit giving yourself so much credit. You act like you guys got some sort of dynasty going on. If your school really cared about that stuff they would handle it. Did it ever occur to you that those transfers will not be cleared? That’s what I heard. No way no chance. I can’t wait to see what your school is really made of then.. I am not a coach and I have not called CIF. But just as an innocent outsider, please please please teach our kids Loyalty and honesty. If you are going to these kids homes and teaching (coaching) them how to manipulate the system and LIE! you are doing your school and our society a terrible injustice. Because after your done using them up for YOUR pride, they go into this world thinking that’s the way it works. Cheat on tests, their spouse(s) steal from their job (If they have one) just play with a level playing field and hopefully someone with some Honor and common sense (Not common) on your staff will coach it up!! and be an example to YOUNG MEN and help them become one. P.S. I don’t believe this is really Coach Marcos but since using your real name is the talk, then there you go. @ Paul Armijo, best of luck to your boy. Shame the line they have assembled in front of him. Remember his safety should be your priority, not loyalty to that bum of an AD. 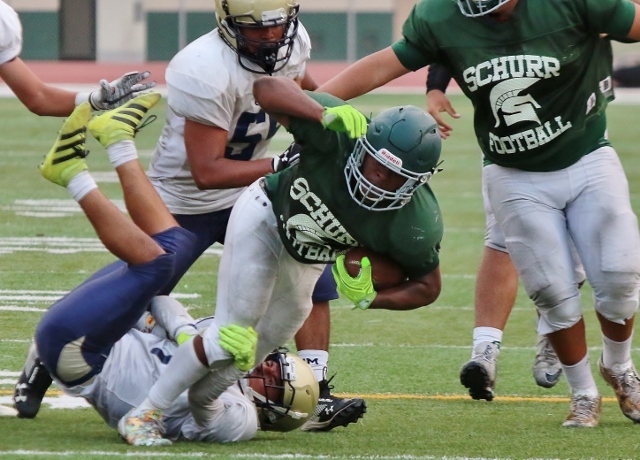 to spartan pride and odyssey and other schurr sellouts….fans included…the kids that were out there during the scrimmage are not “schurr” kids. 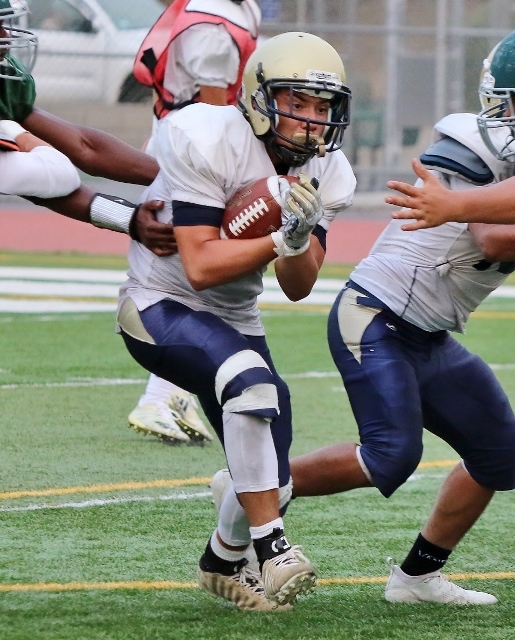 They are the best of the Montebello area that didn’t want to stay at their respective schools dut to ” whole team graduating”, or coaches leaving …a RB from montebello who was the number one rusher ( selling out and going to the rival when he had a starting position at his school) AND WHOM HASN’T MOVED…and a coach from CSH that brought over the other sell outs from CSH. Hope you guys get what you sold your kids out for that have been at schurr. Three yrs in a row of 2nd round bounce and schurr staff had to go out and get lie to get a team to ” keep it rolling”. Nice job staff. Oh, and to the parents there, you know those kids weren’t there and you know they didn’t move…why aren’t you stepping up? Who cares if those srs get penalized. They falsified their information which is an automatic your done!!! Stop being self serving coaches at schurr and play with the kids who are at your school. Say what you want to about paperwork being done or not. CIF DOES NOT want to have to make the decision. They always side with the school the kids go to. They don’t care what the school the kid sold out from thinks. That’s why the problems exist still. Hammer the school and the kids, the free agent parents, and the sleezy coaches. “But I want my little nino to go to schurr for the great education” parents say…lmao. There isnt’ any learning in these schools these days. They got sold a bill of goods plain and simple and I hope they get penalized. Let’s see if CIF has the sack to do what’s right or screw that…..HAVE THE SCHOOL ITSELF DO THE RIGHT THING AND DENY THEM. Teach actual values like how being dishonest is a character flaw…and as cif preaches, winning with honor!! WTC? Really? cmon cif. Just send the message now to everyone at schurr and make them all be denied. @all haters- don’t worry about our cantwell friends! There all good! Don’t matter what position they play! Yes schurr is better because of them and xtrian will be a 🙁 zombie/beast)! Offense will win out! Defense needs to step up or lose like last year due to dc calling horrible game! Linebackers should not be 8 yards deep vs a running qb. 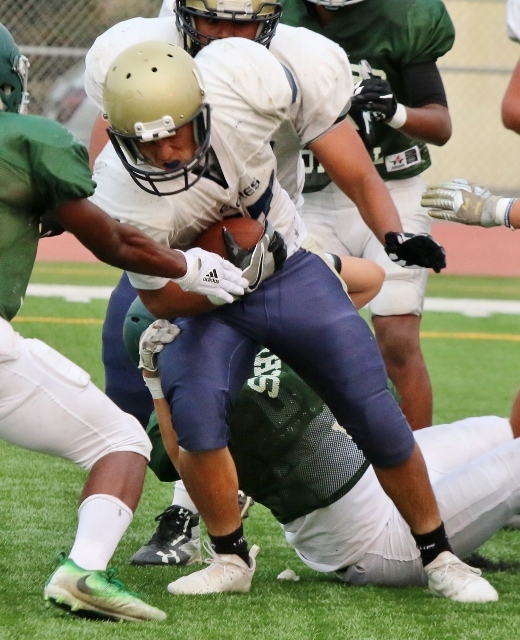 3 yards deep will suffice.mater dei blue print will work son! Gallardo is in trouble. No scheme in the offense what so ever. You had players arguing and frustrated at each other. 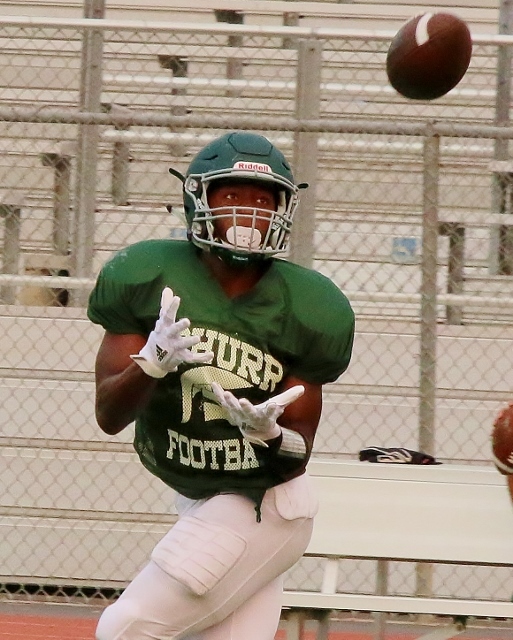 You can’t blame not having two practices on the lack of performance and effort that was shown against Schurr. Line was getting man handled by the Spartans big men the whole night. If we can’t beat Alhambra we are in deep trouble. The kids will all be find. Just like MHS last year and the years before. Only difference is this year is MHS crying to CIF when Schurr didnt on the kids that left Schurr. And on Cantwell kids. Pretty sorry. You sound like a Montebello coach who has been whining about all this to know that much information. Lol If you really want to know why the stuff had taken so long is because there has been no AD for the past couple months. Hey, Cantwell did win their league outright last year and lost to the state bowl champs by two points in round 1 of the playoffs. We were poised for a great season this year before the coaching change and subsequent exodus of players. This season will now definitely be a struggle. I just hope that my son does not get to beat up while playing QB. 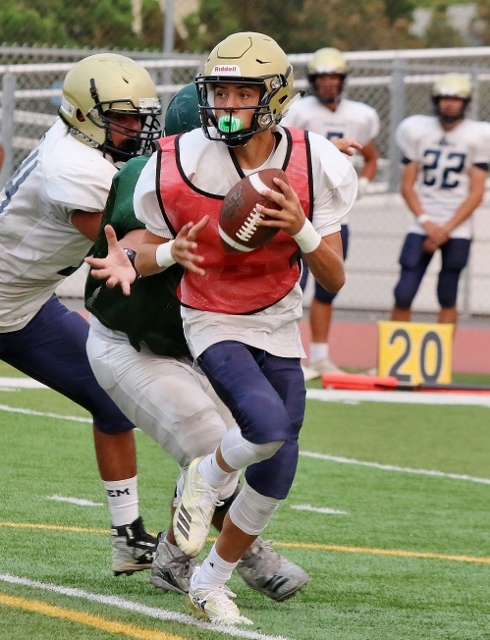 The QB from Cantwell has never even finished a complete season. He might not even play this season if he isn’t cleared. My God people Schurr’s transfers are from Lowly Cantwell. There is not anyone good at Cantwell except The QB. You have 6 “under review” on the cif website… better pray the hammer doesn’t drop. Gallardo is terrible plain and simple, Time will show…. I’m not doubting Gallardo just yet. He’s earned the benefit of the doubt. I was just pointing out the drop off from last season. Im always gonna be honest and blunt, but I didn’t realize SEM didn’t practice. As long as they bring it against Alhambra I’m good man. Come on man. They should of been out there haven’t seen any of these guy teams take the day off. That’s their bad. All are at risk according to what I hear. Only time will tell if CIF looks the other way, or enforces a rule they have in place. I have heard that they don’t even have all the paperwork for all of their transfers yet. I don’t understand what took so long for them to file but who knows?? I know Stacy Honda will be returning to be the principal at Schurr this school year because the former principal had a few unprofessional comments to the MUSD Office regarding the transfers in question (fact). That can’t be good. So, I highly doubt any of them will be ruled eligible by next Friday, unless CIF moves quickly in the decision process. But after that, its a guessing game. Have to feel somewhat bad for these kids, many of whom are going to be Seniors. Ultimately, they made the choice to listen to someone or some people they thought they could trust when they were told to just use a fake address. So it is partly on them too. However, they were blatantly mislead and that’s the real shame here. Time will tell what the verdict is. SEM and all Local teams should take a page from Schurr and go on a recruiting frenzy, teams are being build threw 7 on 7. Its only cheating if you get caught and if you ain’t cheating you ain’t trying. Go Spartans! How many of our players are we at rick of transfer drama? It’s not the limited practice SEM had its that they’re just bad. SEM historically has a solid two years and after is real bad for about two year. You had Hernandez two bad years, followed by Aguilar’s two or three good years, that lead to his real bad years and the current coaches bad first year. That was capped by these last two great seasons they had. I’m thinking before they have another good year they will probably have another coach. Good thing for South is MV is really bad again, Marshall is Marshall and Gab probably isn’t any better. @Kaiser Sosa, I heard SEM didn’t practice the last two days because of the fires so cut them some slack. They will get to were they need to be. Sad to report that the Gallardo experiment at SEM seems to be on the decline. We’ll know more when the Eagles meet the hapless group of Eric Bergstrom. If the swamp struggles against the Moors, all bets are off. Whoa. 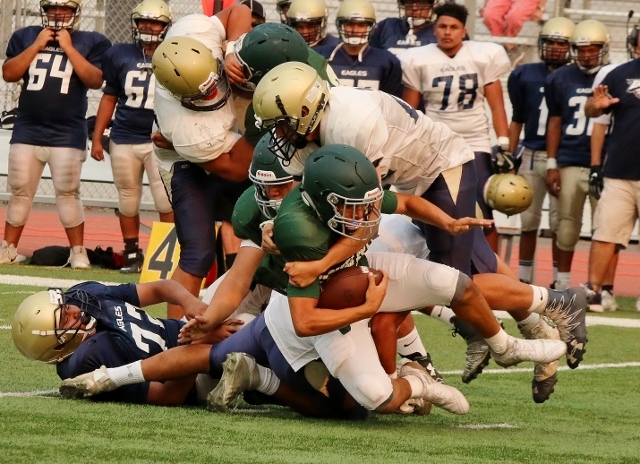 I know it’s really early and I’m trying hard to remember that, but if this is any indication of SEM this season, if you can put any stock in a scrimmage then this is gonna be a long season. SEM didn’t get beat, It was utterly embarrassing at times. They got pushed around they got blown back all day. I can’t think of more than 3 times where SEM gained positive yards. 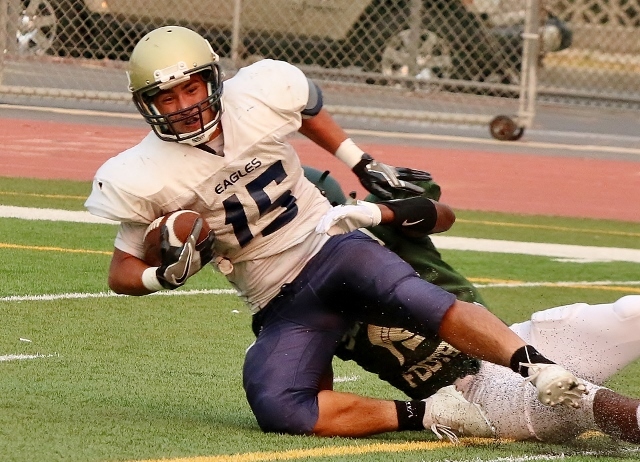 Hopefully Gallardo can get the troops in line and clean up enough sloppiness against Alhambra. Scary thing is Schurr didn’t look all that great but even so this game was never close. I gotta think this was more early season slopp rather than the real SEM. 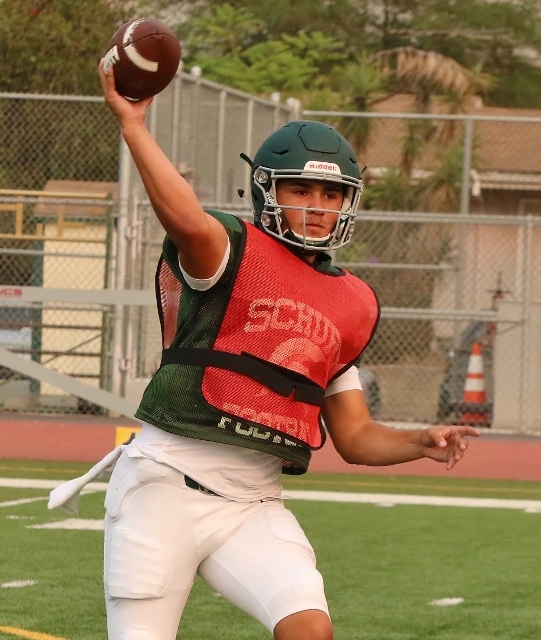 I know SEM was limited this week in practice days but Schurr is going to be real solid. QB is the real deal with a huge arm and he has a huge line along with a plethora of receivers to throw to. Number 13 and 11 are special. Going to be fun to watch. Good luck to SEM this year. Go Spartans!